Note: I had received this book via ‘Wordbite‘ in exchange of my honest review. When you love someone, what’s there to prove? Everything! It looks like life is teaching Rohit a lesson. His publishing deals, his relationships, even his job – nothing seems to be working out. To make matters worse, Karan is still trying his best to ruin him as a writer. But when Nisha leaves him, it’s the ultimate blow. To win her back Rohit must prove he loves her enough to do things that matter to her: like helping Tara find a publisher. As Rohit takes control of his life, he begins to find things slowly changing for the better for him too. But will Nisha be happy with that? Will she come back to him? 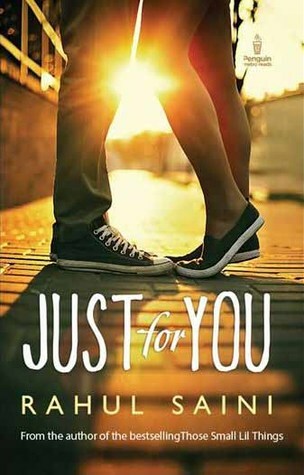 Just for You is an adorable, bittersweet story about love and its responsibilities. The central character – Rohit, an author, rebels against his inner self and struggles to settle with his unbalanced life while Karun, another (very) young author leaves no stone unturned to ruin his reputation as a writer because of his revelry and jealousy towards him. Rohit suffers the ultimate blow when is his girlfriend, Nisha leaves him. In order to gather the ripped shreds of his life, Rohit tries to win Nisha back by doing the things that would matter to her the most, in turn bringing his life back on track (or not)! Meanwhile, Karun keeps trying his best to ruin his career anyway! ‘Just For You’ explores the real world of authors and writers sans the glamour. The story strips off the veneer of style and sophistication from the lives of the protagonists, laying bare the common human emotions—envy, greed, fear and other complexes. One thing that plagues my mind is that I have not been able to slot the novel into a genre. It is definitely not a romance. But the story does force us to think how to find strength in the face of all adversaries. The main thread revolves around Rohit who has a bestseller to his credit. He is a straight forward, honest guy, struggling to complete another novel, and handling the practicalities of life. Rohit has had an altercation with his publishers, and the characters on the periphery are ready to take advantage of the situation. Karun is ready to usurp his position as a bestseller author by any means possible, and Rohit’s boss is hell bent on ruining the future of his protege. Without revealing the spoilers, I just want to say that I really liked the twist in the end. There is a lot of action happening around and in Rohit’s life, and in the first half I felt the extent of human emotions have not been fully explored. I didn’t feel the depth of affection between Rohit and Nisha—Rohit’s girlfriend. The author manages to get the reader hooked when Nisha leaves him. Another small scenario I can’t help but mention and which has to be attributed to creative license— is that Rohit’s boss, boss’s girlfriend and Rohit sharing one room with extra bed on an official trip. A bit far-fetched, and I couldn’t stomach the scene. The tale is narrated in first person through the main character’s point of view. Each chapter spans a scene which are sometimes as small as half a page with a title sentence summarizing the action about to happen. The first half is a bit slow, but as the stage is set for Rohit to take action, the pace picks up reaching a satisfactory end. The novel is written in present tense; a style which takes some time to get used to, but I see the it getting quite popular these days. The language and narration is seamless and engaging. I will definitely read another novel by the Rahul Saini. Just For You, which created a lot of buzz and raised many questions about the current scenario of the publishing industry in India. All his books have featured in various bestselling lists across the nation. and has had successful art shows. He is into film making and script writing as well. Currently he is working as a visiting faculty member for an art and design program at a prestigious university in India.